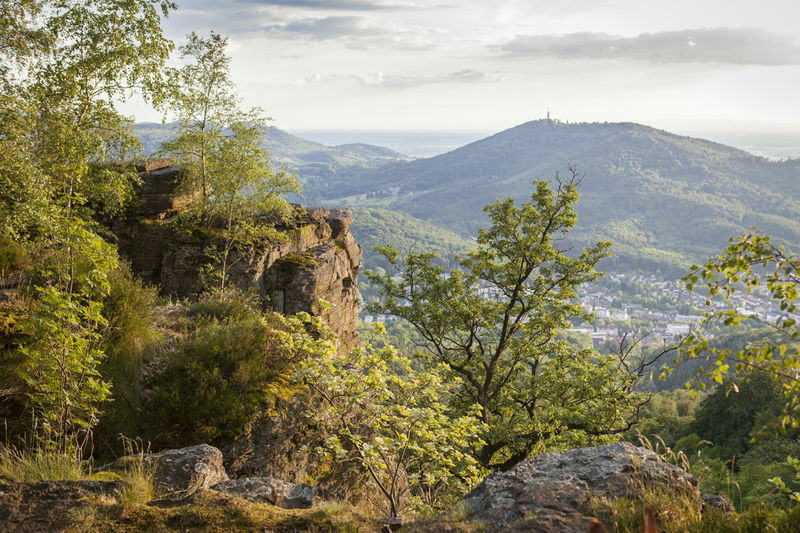 From the "Altes Schloss und Battert" trailhead you can reach one of Baden-Baden’s most impressive natural features: the Battert rocks (Battertfelsen). 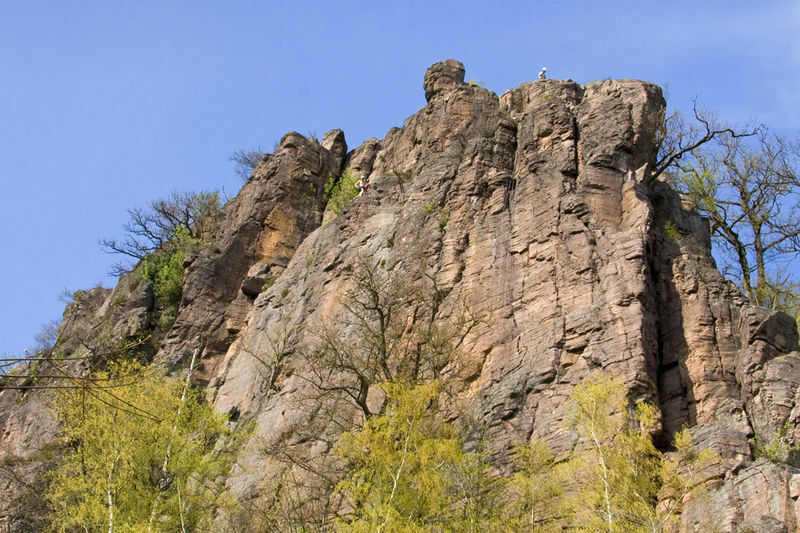 The crags and rock faces were made accessible for lovers of the outdoors at the beginning of the 19th century. Many of today’s paths, including "Unterer Felsenweg" and "Oberer Felsenweg", as well as the paths linking the Battert area with the town centre, were created at that time to complement the town’s main promenade, the "Lichtentaler Allée". This makes the Battert rocks one of Germany’s oldest natural features opened up to public access. Battert also played a key role in the development of climbing as a sport in Germany’s sub-Alpine mountains at the start of the 20th century. 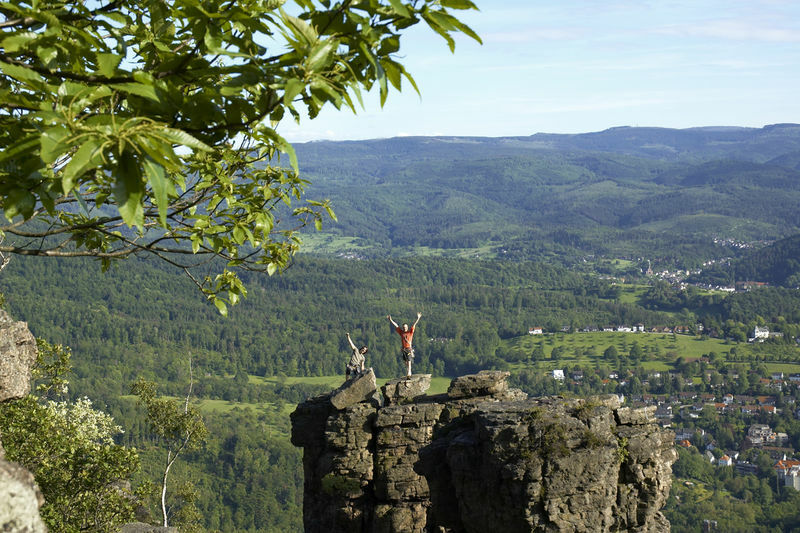 Today Battert, ranked among Germany’s most important geosites, is a protected area. The rock faces are a designated nature conservation area, while the surrounding forest enjoys protected unmanaged status (“Bannwald”). A walk around Battert thus offers not only spectacular views, but also an insight into precious ecosystems and the flora and fauna to which they are home. The interpretation boards provide detailed information on these. The wooden bridge at the top of the rock face (Felsenbrücke) is closed from January until the end of July because of nesting birds. “Bannwald” is unmanaged forest which is left completely to its own devices. This increases the risk of branches breaking off trees or trees falling down. Do not enter this forest in high winds, heavy rain or snow. circular route 2.8 km: Altes Schloss (castle) - Ritterplatte - Obere Batterthütte (shelter) – Bergwachthütte (shelter) -Untere Batterthütte (shelter) - Unterer Felsenweg (path) - Altes Schloss (castle). circular route 10 km: Altes Schloss (castle) - Unterer Felsenweg (path) - Untere Batterthütte (shelter) - Furtwängler Gedenktafel (memorial plaque) - Engelskanzel und Teufelskanzel (rock outcrop) - Wolfsschlucht (small ravine)- Verbrannter Felsen (rock outcrop)- Ruine Alt Eberstein (castle ruins) - Untere Batterhütte (shelter) - Oberer Felsenweg (path) - Altes Schloss (castle). The "Panoramaweg" is a 40km-long circular trail around the town of Baden-Baden. It comprises four sections which, depending on fitness levels, can be walked individually or combined. From "Altes Schloss" (castle) you can follow the "Panoramaweg" to the viewing point "Sophienruhe" and then continue down into the spa town of Baden-Baden. Alternatively, you can head in the opposite direction to the Merkur funicular railway lower terminal (Merkur-Bergbahn), continuing via the Eckhöfe farmsteads through the meadow orchards above Oberbeuern to the hotel and restaurant called Forellenhof. This route takes you through the Märzenbach and Pfrimmersbach valleys, both of which are within a nature conservation area.